It was not long ago that we made an ironic finding…neither of us owned a bonafide, true-blue raincoat. Where’s the irony? Well, for starters, both of us were born and raised in the Vancouver suburbs. A raincoat could and should be considered a staple in any West Coast women’s closet! Truth be told, I’ve always balked at the sloppy, unstructured AND noisy (you know what i’m talking about…like a clown making animal balloons at a 3 year old’s bday party…) jackets that I’ve seen. So, the hunt was on to find a raincoat that we could love. With one non-negotiable: it had to have a hood. I mean, really…how practical is a raincoat that fails at its very purpose: to keep you dry! Success! Here’s our finds and some suggestions for those of you who see more wet than you’d like. What sold Pam on this coat: lightweight material ~ the dark khaki/bayleaf color pretty much goes with anything~ the waist is defined for a slimming silhouette~ love the ruffle detail in the front~ and last, but not least: the hood is concealed but it’s there!! Unfortunately it’s not on sale…it’s definitely a splurge at $375. 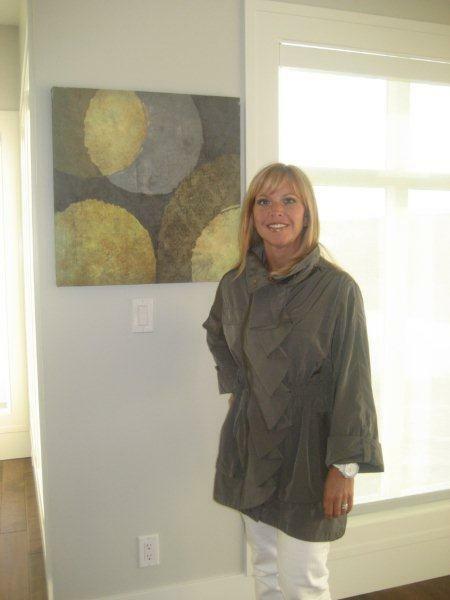 What sold Laurel on this coat: People smile at me when I wear it! True! Red=HAPPY! ~ Soundless, soft and subtly structured fabric ~ waterproof, not just water resistant ~ It’s in the details: lined with great fabric, vents and longer back to keep your tosh dry! One of our dear friends, Andrea, joined in the challenge and purchased the above trench from J Crew! She is loving it and looks like a million bucks in it! We’ve also found some great deals! Check out Bluefly’s Michael Kors $79 hooded trench http://www.bluefly.com/MICHAEL-Michael-Kors-british-khaki-cotton-blend-hooded-trench/SEARCH/311204201/detail.fly It’s a great deal, regularly priced at $200. 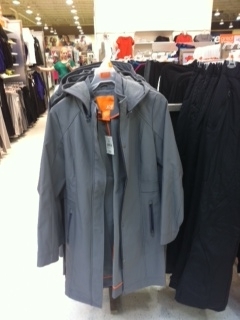 I’ve spotted a great trench by Joe Fresh as well…located at the Canadian Superstore for you locals!! 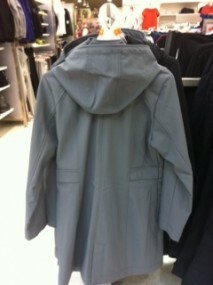 Rain coat from Joe Fresh, $69. Comes in gray, black and white.